Darrell Pitt delivers a new take on two well-loved genres in his series Teen Superheroes. Mixing Superhero with Alien Invasion, Pitt creates a world on the verge of an invisible war whose salvation rests in the hands of five teenagers, each as unique as their country of origin. 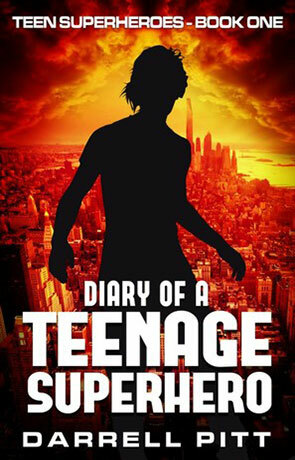 In book one, Diary of a Teenage Superhero, Pitt introduces the reader to his cast of misfit teens and sets up an excellent opening book for the series. As of July 2014, there are three books published for Teen Superheroes with hints of a fourth on the way. Synopsis: A quick read, only spanning 188 pages! The best way to categorize how this story takes off if with the words: confusion and panic. Not necessary a bad confusion for the reader, it is our protagonist, Axel, who is frantically piecing together his identity until ultimately meeting up with four other teens with unique, separate superpowers. The other teens are great supporting characters, providing a nice balance to the story, there is: Brodie, the Aussie chick who can kick anyone’s tail; Dan, the Chinese kid who can manipulate steel and move objects; Chad, the Norwegian tough guy who can summon both fire and ice; and Chad’s sister, Ebony, who can make any material dissolve with her touch. And then there is Axel with his power to control air in ways that are new and imaginary from any superhero I’ve come across. I would liken this story to the more recent film Chronicle. In both, teens discover then test their powers before having to use their gifts for either good or ill. Throw in some aliens and you have a great new series that will satisfy both younger and older readers. Critique: There is a reason I am giving this story four and not five stars. I will be up front. It felt unpolished in its pacing and transitions from scenes and chapters. At times, I was introduced to a new character, a fight scene, and another fight scene in just a few short pages. Although fast-paced, I found myself losing track of the plot as things moved so quickly. This could be a personal quirk of mine as I am a fast reader by nature, but the reader needs time to absorb what is going on. Now the good stuff! The story and characters are very appealing, and I am hooked to read the rest of the series. I really enjoyed what our heroes are capable of doing and the threat that still lurks at the end of the novel. Overall: a great first book to the series! Written on 11th July 2014 by D. L. Denham.